Painting a house is labor intensive, time consuming, and potentially dangerous. To do it well requires preparation, the right tools, skilled labor, and a solid education about the different products, surfaces, and techniques involved. Paint Saint Louis includes a carefully chosen and small group of qualified trade contractors, all of whom are bonded and insured. These discriminating and dependable professionals are cautious and neat, with the skills and expertise necessary to meet all your requirements. At Paint Saint Louis, our goal is to satisfy all your needs and offer a variety of residential and commercial services. We use only premium paints and supplies, like Sherwin Williams, in order to assure success and a quality painting experience. If you wish, we can also offer the services of a color consultant to help you match colors and work with you to apply samples. At the end of the job, we will also help you record your product and color choices for future reference. At Paint Saint Louis, we know that color sets a mood and can also make a room appear smaller (dark colors) or larger (light colors). The perception of color appears to change with different lighting (sun/shade, day/night). Color samples are recommended to ensure you will like the colors in your home. We carry 4” x 4” samples of Sherwin Williams’ colors and can get 8.5” x 11” versions upon request. Painting splashes of color samples is also an option, but talk with us first, as that may add a step to cover them up during final painting. On interior projects of $3,000.00 or more, Paint Saint Louis offers one hour of color consultation, free of charge. Additional color consultations are available at the customer’s expense. 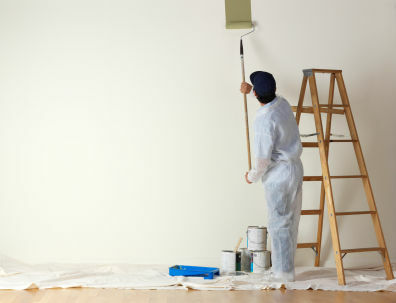 Our painting contractors will fully prepare the interior of your home and protect all of your belongings. Flooring is protected with drop cloths, builder paper, or plastic and taped down at the edges. Switch plates, outlet covers and window blinds/shades are removed. Any surface mount or hanging light fixtures and window glass is protected with plastic and/or painter’s tape. The only thing we do not do is move furniture because we work in small crews and it requires additional insurance. It is recommended to hire a true labor/moving company for any items we cannot assist you with moving. We generally recommend clearing the entire area since any obstacles left in a work area can increase time/cost and can cause accidents or the use of improper painting techniques to work around items. Our painting contractors also have the skills to perform complex repairs in your home (these will be specifically noted on your estimate). These include replacing or repairing sheet rock, scraping, taping, texturing, sanding, removing wall paper and caulking cracks along doorjambs, baseboards and ceiling crown. Before any sanding/scraping can occur a lead test will need to be performed as part of the EPA Lead-Safe regulations. At Paint Saint Louis, we use only superior materials from Sherwin Williams to ensure the highest quality finish. Paint is applied by brush and roller whenever possible. Acoustic texture (“popcorn”) ceilings must be sprayed. At Paint Saint Louis, we promise to never leave a room in your home partially finished. At the end of every working day, we will clean up and remove all supplies, tools, and trash. All trash, is removed and disposed of properly. We will also re‐hang shades and blinds, and replace all switch plates and outlet covers. When we leave, your room will be ready for you to enjoy! A formal walk through is conducted with you and a Paint Saint Louis foreman and/or Project Manager to assure your complete satisfaction with our work. Our workmanship is guaranteed and backed by our 2-year Paint Saint Louis Limited Labor Warranty. You also have a free 30 day call back in case we both miss something during the initial inspection so no extra labor charges for a follow up visit. © 2018 Paint Saint Louis, LLC. All Rights Reserved.